Good news friends…Jane and I have been engaged for one month! Where did the time go? This also means that it is now only six months until 29 December! Very exciting! One of the wonderful aspects of becoming engaged is the joy that is shared by family and friends. There was certainly something magical about those moments right after becoming engaged when we made phone calls to our parents and siblings to announce the news. It’s the first thing we did, got engaged then told others. Right on the very spot where I proposed we stood and called our parents to tell them that we were going to get married. (Incidentally my parents, who knew I was going to propose that day, told us on the phone that they were, at that moment, at the checkout and had just bought our engagement gift…talk about efficient!) I guess telling others makes sense because the whole point of becoming engaged is to get married, and the whole point of me marrying Jane is be publically state that I choose to love her before all others. It’s definitely something to celebrate. If you are considering engagement, I can recommend it! Being in a Facebook world we also had to share the news there and immediately so many people began sending messages of love and support. I think Jane received her highest ‘like’ rate ever but then it’s not often that one writes “I’m engaged” on one’s wall! I guess in a world before Facebook we would have made many more phone calls to friends but none the less whatever generation it is people want to tell other people. Within days, and continuing still, we began to receive engagement cards, which have mostly come from extended family and friends. To open a card from someone, especially someone who is not even in your immediate circle of contact is very touching. A card is such a simple gesture but when I think that someone has taken the time to find a card, write down a message of support and post it to me, I really am moved. With every message of congratulations Jane and I feel more certain that our next step is taken with the support of others. In fact for me one of the nicest aspects of getting engaged has been quite simply, people. Perhaps more than ever, we live in a world that is disconnected from people. When I get on the train in the morning and 95% of the carriage has headphones in their ears there is the feeling of disconnection, they have their lives and I have mine. I think we often feel the need to keep our private lives to ourselves but I have seen in these weeks that when the opportunity arises, people love nothing more than being involved in the lives of people. And that has been my experience, the joy of sharing this special moment of our lives and allowing others to share it with us. Getting married is perhaps the most common thing humans do and in walking this path to marriage Jane and I have become united with all those who have got married, I think especially of my parents and grandparents and great grandparents. Their marriages and their willingness to publically state their desire to love another person creates this wonderful chain of life and love. Actually even in writing these few words each week I have been able to hear from people who I would not have otherwise, they have contacted me to say that they are so excited for Jane and I and they are accompanying us with prayer. With prayer! People out there are praying to God in heaven for me and Jane! That is so completely wonderful. Again and again what comes to me is how much we need one another. And so while I am grateful for all the messages of support and the way people have shared in our joy it has been a source of reminding me again to focus on people and on the joys in their lives. 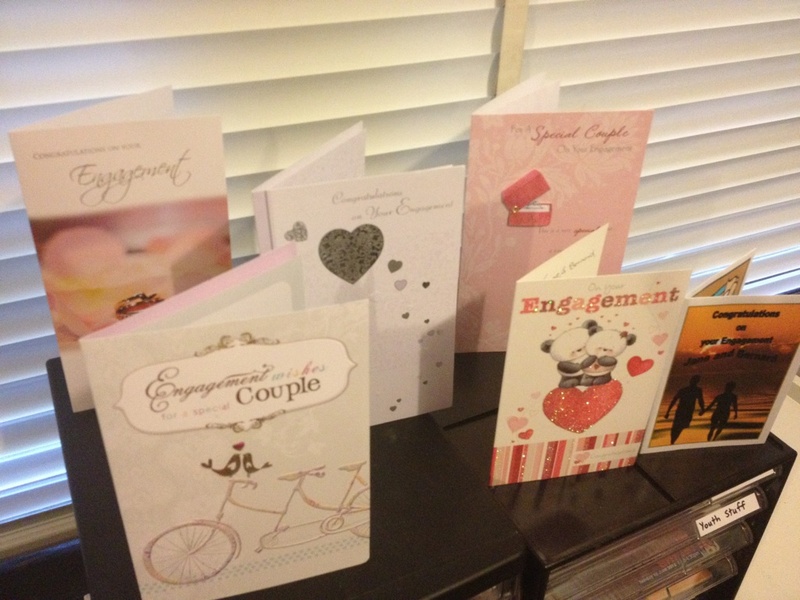 I think I will go out now and buy a supply of greeting cards and stamps. Posted in Uncategorized and tagged cards, engagement, facebook, joy, marriage, proposal. Bookmark the permalink. Great that you are engaged to a fine Catholic girl…convenient that you work in ths same building..
however,what on earth makes you think that your situation will be of interest to most CW readers? Most of them have been there,done that,often many years ago. Your column takes up space that could be allocated to news items,articles about the faith,ethics,social justice,etc,with some emphasis on the church worldwide–and so make the paper a better read. There is just too much space taken up by columns which are of minor interest,and serve merely to publicise individuals and bodies like Notre Dame Uni who are editorial favorites. Noel, many people are interested as Bernard has a huge following. And I’m not sure what makes you think that most people have ‘been there and done that’? There are many discerning people out there who have not yet married or are on the path of marriage. And for those who are married, it is refreshing and inspiring to be reminded of what that journey was like, no matter how soon or long ago it was. And yes there are many issues and topics that CW can write about. I would hope there’s a balance between head/heart stories. Some personal and some general. A nice balance is important in the world. Especially the Catholic world which I love so much. In saying this, Bernard keep up the great writing and we look forward to you and Jane’s next interesting step to the marriage club.